No more worries about running out of propane right in the middle of grilling, cooking, smoking, camping or RVing. And no more unnecessary trips for refills when there was still some left in the tank. With the GasSaf propane tank pressure gauge on board, you'll always know when you're good to go. Screw threads let you attach it without tools, and it fits all brands and models with a QCC1/Type1 connection and up to a 40lb. propane tank. 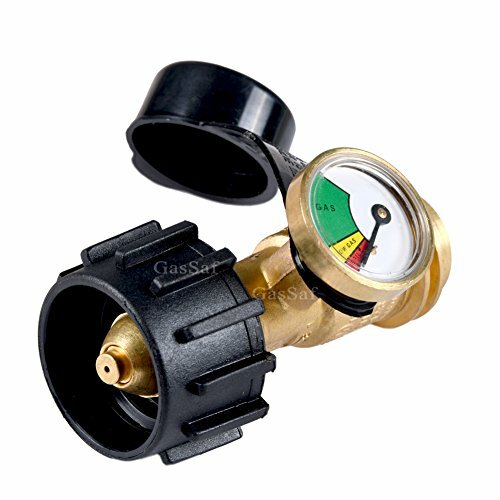 This propane tank gas gauge can be worked with propane tank cylinders, propane regulaor with hose and propane adapter. Great for using gas grill, heaters, smoker, camp stoves, lanterns, tabletop grills, fire pit tables, turkey fryers and more propane gas tank cylinder appliances. Cheaper metals can get corroded, plated surfaces scratched and worn away. But solid brass is impervious to the elements and highly resistant to damage during use or transport. Provide you the heavy-duty service. No need to bend over or squint at tiny level markings. One glance at the GasSaf's large dial will tell you whether you're in the red (empty), yellow (low) or green (sufficient). Long lasting high quality material provides secure, air-tight connection between propane tank cylinder and propane regulator with hose, propane adapter and more propane appliances. Provides excess flow protection in case of a broken gas line and thermal protection in case of fire. 1. Simply look at the meter, without mentioning the weighed tank, you will know exactly how much gas remains in the tank, there are three levels; natural gas, low gas, supplement. 3. High-precision meter, high-quality brass, can perfectly provide oven, airtight connection between RV and tank, very durable and sturdy. 4. Quick connector, suitable for type1 connection, BBQ is perfect. No tools required, easy to install. If you have any questions about this product by GasSaf, contact us by completing and submitting the form below. If you are looking for a specif part number, please include it with your message.